The citrus canker season is just over a month away, so it is time to plan a canker management program to avoid fruit drop or fresh market quality loss. With the current state of HLB in Florida, it is easy to forget some of the other potentially crop-destroying pests in the grove, especially when, unlike HLB, their impact is heavily dependent on the weather. Citrus canker can cause almost complete crop loss if environmental conditions are favorable for disease spread early in the season, as is expected with heavy rains in the long-range forecast for this spring. This crop loss comes from fruit drop induced by canker lesions on young fruit. With properly timed management, growers can reduce the midsummer canker fruit drop and protect yields. Continued throughout the season, proper management can also protect fruit quality. In groves that had a major infection event from Hurricane Irma, especially young groves, the effects of Irma still pose a citrus canker management challenge. Stem lesions that developed during the strong windblown rain of Irma will continue to be a troublesome source of inoculum, even through long spells of unfavorable weather for canker. Any grove that had canker develop from Irma will need a strong canker management plan. The best citrus canker management plan is still copper sprays every 21 days from first susceptibility (0.25 inches for sweet oranges and 0.5 inches for grapefruit). Traditionally, the first spray would occur in early April. 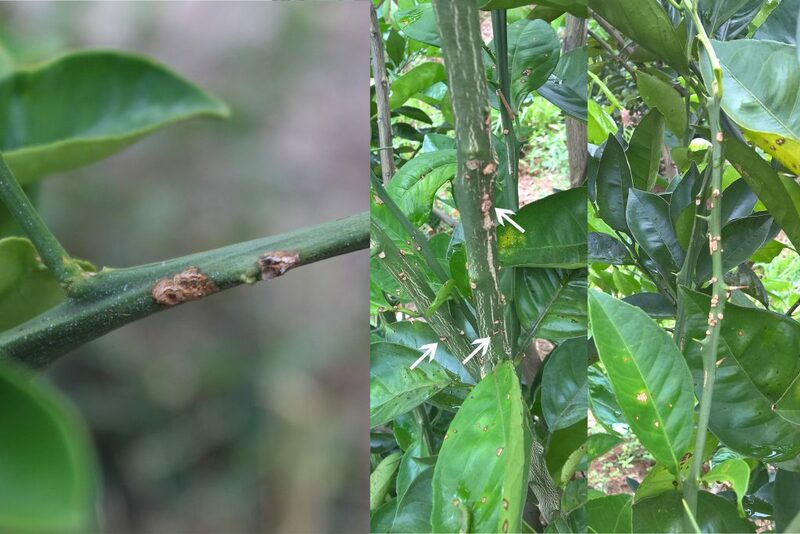 One of the consequences of HLB is early flowering, which can also require earlier copper sprays for canker management. In some groves, copper programs may need to start in mid to late March. For juice fruit, only five copper sprays are normally needed into late June or early July. Canker lesions on the fruit are much less likely to cause fruit drop after this stage (approximately 1.5-inch diameter for sweet oranges). For fresh fruit, copper sprays normally need to be maintained on a 21-day schedule until the fruit is fully expanded. 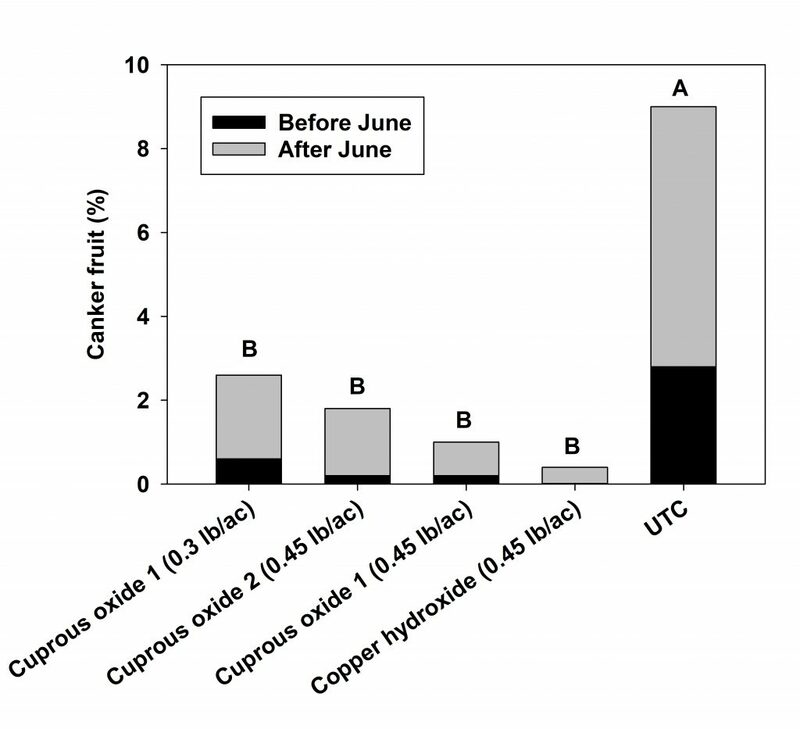 For citrus canker, 0.5 pound metallic per acre of insoluble coppers (such as copper hydroxide or cuprous oxide) is usually sufficient (Figure 1). However, higher rates will sometimes be needed for fungal pathogens such as greasy spot. Figure 1. Copper management of citrus canker on Ruby Ray grapefruit with two formulations of cuprous oxide and one formulation of copper hydroxide compared to an untreated control (UTC). For fresh market fruit, care needs to be taken with summer sprays to avoid phytotoxicity. The most common and avoidable cause of copper peel phytotoxicity is mixing copper with foliar nutritional sprays, which should never be done. Copper does not have a kick-back effect. In other words, it does not work if applied after an infection event. It is important to have the copper barrier layer on the fruit before a rain event. With more susceptible varieties, there is no room for error if an unexpected rainstorm develops. This is particularly important in groves that had major canker outbreaks caused by Irma, even if very few leaf lesions are visible. Leaves with severe canker tend to drop quickly and remove themselves as a source of inoculum. However, stem lesions that form on young green branches will continue to produce bacteria during wetting events for at least four years. Figure 2. Stem lesions continue to produce bacteria for at least four years and become difficult to see once the bark hardens and is no longer green. For groves that had heavy canker infestation after Irma, it is almost guaranteed that they will have significant stem lesions (Figure 2), especially if they are younger and the grove did not have windbreaks. For the next few years, it will be important to maintain continuous coverage of copper during the canker season. The 21-day calendar sprays generally do a good job of keeping this coverage, but may fail with particularly high rainfall. After a dry spell, it may be tempting to skip sprays, but this is not recommended. While some areas of the fruit may have good copper protection, the expansion of the fruit leaves unprotected areas on the peel. The copper model (agroclimate.org/tools/citrus-copper-application-scheduler/) can help predict if extra sprays are needed because of copper runoff from heavy rain, or if environmental conditions have limited fruit expansion and runoff to delay sprays. Systemic acquired resistance (SAR) inducers such as Actigard are known to reduce inoculum. Actigard is labelled for application twice per year and can be used to reduce leaf inoculum. The SAR effects on stem lesions have not been directly tested. It is best applied post-bloom, but before favorable conditions appear. This will limit expansion of infection into the spring flush, reducing the total inoculum load that can infect the fruit if favorable rain events occur. It might also reduce activity of stem lesions, although this needs to be studied in greater detail. Windbreaks continue to be one of the best methods to reduce the spread of canker within a grove, especially when combined with a good copper program. There may still be gaps in windbreaks after the damage caused by Irma. Hopefully, these gaps are well on their way to recovery with the replanting of windbreak trees. However, groves with gaps in their windbreaks still need special attention. Higher winds will continue to funnel through the gaps, creating a zone in the block with highly favorable conditions during thunderstorms. This is also an area where SAR induction might be helpful because copper has reduced efficacy in high wind conditions. The bacteria can be blown straight into the leaf through the stomates, without contacting the copper barrier on the leaf and fruit surface. Citrus canker has become a perennial problem that has been made more challenging by stem lesions created by Irma. It can be managed with proper planning and use of available tools. With the forecast for heavy spring rains, early management will be key to maintaining a crop on the trees this year. This combination of lasting Irma inoculum and forecasted rain means now is a good time to put an integrated canker management program into action with both copper and SAR inducers. As long as growers maintain a strong canker program from March through June, yields should be protected, especially for Hamlin and grapefruit blocks. Any fresh market block needs additional vigilance through fruit expansion to protect packout, but the early-season canker management is essential in all groves. Evan G. Johnson is a research assistant scientist at the University of Florida Institute of Food and Agricultural Sciences Citrus Research and Education Center in Lake Alfred.